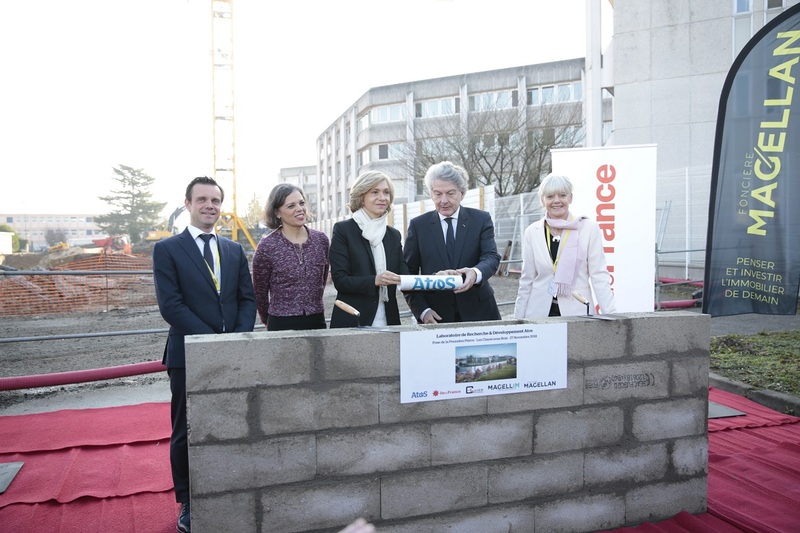 In the middle, Valérie Pécresse, Île-de-France Region President, and Thierry Breton, Atos CEO, with Véronique Coté-Millard, Clayes-sous-Bois Mayor, Sophie Proust Houssiaux, Atos R&D Director (BDS), and real estate developer Steven Perron (Magellim).27 Nov 2018 Les Clayes-sous-Bois, Yvelines - Atos, a global expert in digital transformation, has officially launched the start of the construction of its new global Research & Development Lab in Les Clayes-sous-Bois, in Yvelines. The new 8000 m2 lab will be built on Atos' existing R&D site. It will provide a modern space dedicated to research in quantum computing, closely connected with the high-performance computing and cybersecurity research programmes of the Group. Built within Atos' site at Les Clayes-sous-Bois which employs almost 1000 people, the future lab will host Atos' R&D teams with around 350 highly qualified engineers. Atos' quantum computing research programme benefits from an investment of 5,000,000 euro from the Paris Region as part of its 'Smart Industry' strategy, adopted in July 2017. "I welcome this key step in the development of the industry of the future in the Paris Region, a strong signal for the attractiveness of our region. We are thus reaffirming our commitment to making the Paris Region an innovation territory, a leader in digital transformation. This approach is in line with our ambition to promote the implementation and development of strategic technologies in the Paris Region. Quantum computing is one of them and will have major impact, particularly in terms of cybersecurity and artificial intelligence", stated Valérie Pécresse, President of the Paris Regional Council. "I am delighted to launch today the start of the construction of our R&D Lab, which will house our ambitious quantum computing programme, driven in partnership with the Paris Region", stated Thierry Breton, Chairman and CEO of Atos. "Our future lab, rich in more than 50 years of research work carried out at the historic site of Clayes-sous-Bois, will develop strategic technologies which will shape the future of computing for decades to come. It is on this historic site that Atos researchers will work on the first quantum accelerators and, in conjunction with the intensive computing R&D programme, on future hybrid supercomputers. Their world-class work will benefit our clients, our academic partners and the international reputation of the region." The future R&D lab will accommodate the research work done as part of the Atos Quantum programme, the first major quantum industry programme in Europe, launched by Atos in 2016. This programme aims to develop and market quantum computing solutions, as well as quantum safe cyber security products. Atos researchers developed the Atos Quantum Learning Machine (Atos QLM), the world's highest-performing commercially available quantum simulator, already marketed to the world's most prestigious universities and research centres. The programme's future work will focus on the development of quantum accelerators, which will benefit future hybrid supercomputers developed in parallel by Atos' high-performance computing teams and researchers.